Each of our vases are hand-crafted and hand-finished in our USA foundry. They are durable and elegant, use them on special occassions or everyday. Flowers brighten any room, but they also brighten someone's day. Choose a size and put together the perfect arrangment to brighten your home or someone's day. Hampshire pewter can provide engraving on all it's vases. 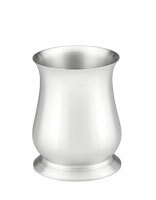 Add a monogram, message or date and personalize the perfect vase today.